30 million Africans have HIV/AIDS. In the summer of 2003, two years after the release of his award-winning AIDS documentary RACE AGAINST TIME, United Nations' HIV/AIDS envoy Stephen Lewis returns to Africa and documents his incredible personal journey that has led from hope to despair to hope again. After September 11, when the world's attention turned to homeland security and fighting terrorism, the promises of financial aid to Africa lay broken. Africa, with more than 6,000 people dying every day and 11 million orphans under the age of 15, was a continent enveloped by death. Lewis was convinced that all that was needed was determination and financial resources. The most urgent need was for life-prolonging anti-retroviral drugs for the dying. In Africa these drugs are available to only 75,000 of the four million people who need them. In 2003 the momentum is finally reignited. Endless disputes concerning generics and the patents held by big pharmaceutical companies have been settled. The World Health Organization has pledged to have three million people on anti-AIDS drugs by 2005. That amounts to a staggering six million pills every day. It is the sheer volume of drugs needed that has led Lewis, along with a handful of Canadian aid agencies, to challenge the Canadian government to pass legislation allowing patents to be circumvented in favor of inexpensive, generic AIDS drugs. If the bill were to pass, it would make history. 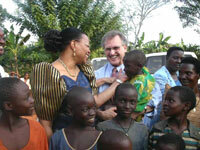 "Stephen Lewis demands that we look at the human devastation caused by AIDS in Africa. He puts the blame for the world's failure directly on the wealthy western nations, where it properly belongs!" "[The Value of Life] is a powerful introduction to the African AIDS pandemic seen through the eyes of the United Nation's Special HIV/AIDS envoy Stephen Lewis. Years of neglect - of medical apartheid - have muted the voices of people living with and communities affected by HIV/AIDS, but Lewis' voice resonates with a sense of urgency - altering between rage at the slow pace of scale-up and hope as barriers to treatment are gradually reduced. One of the strengths of the film is Lewis' effort to reconnect with PWAs he has met before and his empathy with children. But viewers should look beyond the foreground of Lewis and his personal crusade to the stark images of ruined, yet heroically struggling communities. If viewers connect with these images of our brother and sisters, our sons and daughters, then they should join Lewis and demonstrate their solidarity by speaking truth to power and by demanding global access to the treatment, prevention, and care methodologies wrongfully withheld from those most in need." "[The Value of Life] is an outstanding and valuable educational resource for use both in and outside the classroom." "An important addition to any course dealing with global health and development issues. I would definitely use it regularly for my Geography of Africa course, as well as almost any Environmental Studies course." "*** The Value of Life benefits from Lewis' personal perspective, and serves as another wakeup call to this global catastrophe. Recommended." "Particularly noteworthy are the statistics provided for each country visited... The footage captures the stark reality of the pandemic yet manages to portray the spirit of the African people as well. This quality production is recommended for public and academic libraries." "[The Value of Life] would be a good addition to any collection that deals with the AIDS crisis in Africa. Recommended."